DeVere sales, marketing and service teams are in constant communication with the company’s business customers. These teams use their experience and knowledge to work with DeVere chemists in designing progressive cleaning programs for any type of corporate environment. DeVere economical concentrates and convenient aerosols clean every item in the front office – from office equipment, desks and cubicles to upholstery, furniture and carpeting. DeVere even has products to address particular problems – from removing dry erase marks on whiteboards to eliminating odors in trash receptacles. DeVere disinfectants are effective against common germs found in the office. These products disinfect the surfaces that harbor bacteria: reception area counters, telephones, light switches, walls, doors and doorknobs. The result is a healthier working environment with a lower risk of transmitted illnesses. DeVere does not stop at providing businesses with cleaners and sanitizers. DeVere also carries a complete line of paper products and dispensers can liners, hand soaps, kitchen and dishwashing products, and restroom cleaners, disinfectants and deodorizers. DeVere’s knowledgeable staff has over 100 years of combined experience to provide its corporate customers with the most progressive cleaning solutions. OW All Purpose Cleaner (WOW) is one of the strongest yet safest detergents made. It contains an exclusive wetting and cleaning agent, for powerful action on light soils to heavy grease. 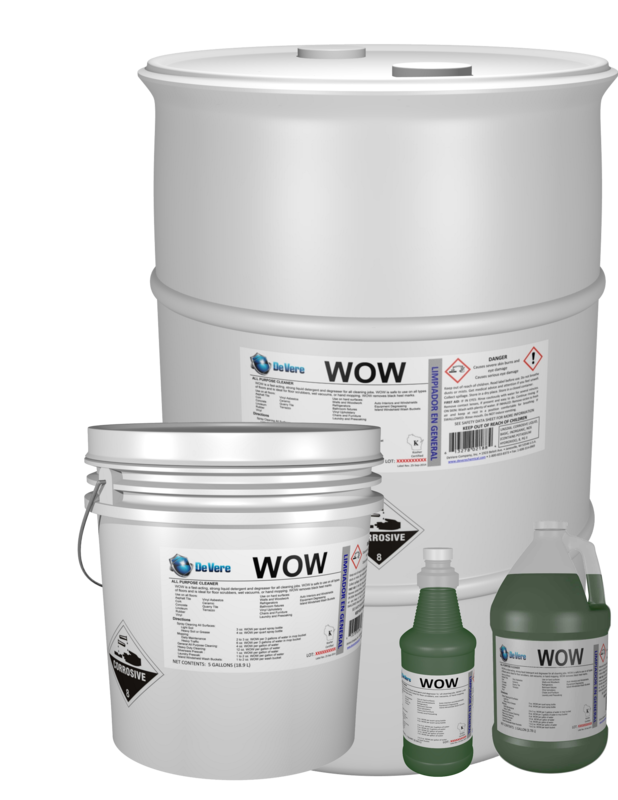 WOW is excellent for cleaning a wide range of hard surfaces from walls and woodwork to automobile interiors. Citrus Plus Foaming Cleaner is a convenient aerosol for all purpose cleaning. Use it to clean countertops, walls, appliances, upholstery, fixtures even stainless steel! Citrus Plus Foaming Cleaner sprays thick, white foam that quickly penetrates soils for easy removal. It also leaves a fresh citrus scent. Carpet Stain Remover is a powerful aerosol that is formulated to remove tough spots and stains from carpets instantly without rubbing or scrubbing. It works on both new and set-in stains. Carpet Stain Remover is also ideal for use as a pre-spotter prior to carpet cleaning extraction. InstantFoam Non-Alcohol Foaming Hand Sanitizer provides instant hand sanitizing WITHOUT WATER. It kills 99.99% of most common germs in 15 seconds. InstantFoam Non-Alcohol Foaming Hand Sanitizer is gentle to the skin and hypoallergenic. It has a mild lavender scent and leaves no sticky residue on the hands. C-Clear Glass Cleaner is a convenient aerosol with a thick, white foam that clings to surfaces for ease of use. It does not run or drip like other household window cleaners. C-Clear Glass Cleaner cleans quickly and leaves no film. It will clean a variety of hard-to-remove soils from glass and will not streak. One Step Quaternary Cleaner and Disinfectant is an EPA-registered Disinfectant, Non-Food Contact Sanitizer, Cleaner, Mildewstat, Fungicide and Virucide* all in one. Use this product when cleaning and disinfecting in one step is required.